September 11, 2018 -- The U.K. radiologist responsible for much of the important early clinical development of CT, Dr. Ian Isherwood, died on 3 September at the age of 87. Tributes are already flowing in for a key figure in the history of European medical imaging. Isherwood, a professor of diagnostic radiology at the University of Manchester from 1975 until his retirement in 1993, was at the forefront of advances in the teaching and applications of radiology, and he helped establish diagnostic radiology as an important specialty in academic medicine internationally, according to the university's library entry about him. He promoted multidisciplinary research into the development and application of new imaging techniques in many important areas. 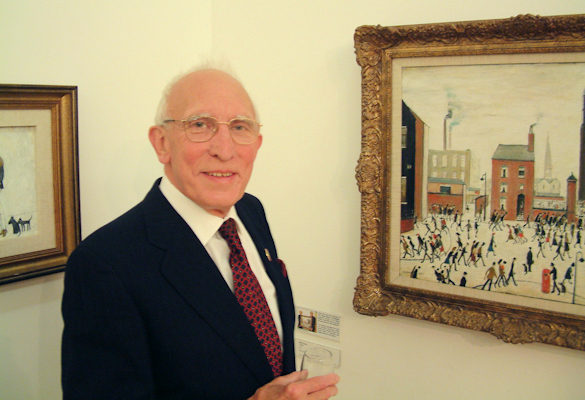 Spirit of Manchester: Isherwood was a history buff who admired the work of local artist L.S. Lowry. Image courtesy of Dr. Adrian Thomas. "He pioneered the use of CT scanning in medicine; the world's first commercial CT head scanner was installed at Manchester Royal Infirmary in 1972, and the first commercial whole-body scanner in Europe was installed in the university's Department of Diagnostic Radiology in 1975," it reads. "He was one of the first to recognize the huge impact that Nuclear Magnetic Resonance (NMR), later referred to as MRI, would have on the diagnosis and management of disease." Friends have been sharing their memories of Isherwood, who was president of the European Association of Radiology (now the ESR) from 1989 to 1991 and became an honorary member of the RSNA in 1993. "Ian played a major role in promoting academic radiology, and under his direction the Manchester radiology training scheme became one of the largest and most respected in the U.K.," noted Dr. Adrian Thomas, honorary historian at the British Institute of Radiology (BIR), of which Isherwood was president in 1984-1985. "Ian was always charming and was masterful at chairing committees. He had a quiet smile, and he will be missed by many." In December 1971, Isherwood met with James Ambrose at London's Atkinson Morley Hospital to view the prototype CT scanner being developed by Godfrey Hounsfield. Isherwood was immediately aware of the technique's potential, and the EMI CT1000 machine was installed in Manchester in late 1972. This was followed in 1975 by the EMI CT5000 body scanner. In a similar manner, Isherwood could see the major role that NMR would have, and in 1983 a Picker 0.26-tesla superconducting MRI system was installed in his department, Thomas recalled. Isherwood's knowledge and understanding of CT and its potential both as a major diagnostic tool and an anatomical teaching tool were superb, even at this relatively early time in CT, explained Liz Beckmann, principal and founder of the consultancy firm Lanmark Medical. In the late 1970s, Isherwood demonstrates an image from the EMI 5005 machine installed at Manchester University. He shows how the kidney can be seen as clearly on the CT scan as it could on the sliced specimen alongside. Image courtesy of Liz Beckmann. "I learned so much from Ian about the benefit that CT would give to both patients and doctors," she wrote in an email to AuntMinnieEurope.com. "Ian's knowledge and skill as a radiologist -- predominantly a neuroradiologist -- was exceptional. He was a wonderful teacher. His explanations and descriptions were always very clear, but he was always very willing to re-explain something if I had not understood the medical details." Beckmann has vivid memories of attending the international symposium and course on CT in Las Vegas and a CT meeting in Graz, Austria, and enjoying several dinners with Isherwood, his wife Jean, and other colleagues. "He was always supportive and encouraging of many of the activities of the BIR and was incredibly helpful when I was president of the BIR," Beckmann said. "He was the driving force for many years of the plans, which resulted in the very successful congress in 1995 to celebrate the centenary of the discovery of x-rays and was the president of this multisociety congress." The last time she spoke with Isherwood was earlier this year, when he phoned her to ask if she had heard how a mutual contact was doing. Isherwood said he was concerned that he had not received the normal Christmas card. "This was typical of Ian: a concern about others," she continued. "I have been so privileged and pleased to have known him for the last 40 years." Isherwood was born in Batley, Yorkshire, England, on 30 March 1931. He moved to Lancashire when he was 6 and went to school at Eccles, where he met Jean Pennington, who was a fellow student. He studied medicine at the University of Manchester and graduated in 1954, and he married Jean in the same year. Isherwood also spent some time in Stockholm at the Karolinska and Seraphimer hospitals, where he was impressed by the daily interaction between senior radiologists and engineers in both hospitals and the factory and the influence this interaction had in placing radiology in the center of the hospital and at the forefront of clinical care. For Isherwood, the brain was "an imaging quest." Image courtesy of the Manchester Medical Society. "I entered radiological training in Manchester in 1955, as the first Macdonald's opened, when percutaneous carotid and vertebral angiography, and tumbling pneumencephalograms were the norm," Isherwood wrote in a reflective article in 2007 (see page 8).. "One of the reasons for my additional training in Scandinavia was to learn about the new Seldinger method of intravascular catheterization. It was a revelation to see Amundsen in Oslo actually using a femoral catheter to demonstrate the cerebral circulation!" He was made consultant radiologist at Derby Royal Infirmary in the U.K. in 1961. Two years later, he returned to Manchester Royal Infirmary as a consultant neuroradiologist and deputy director of the department of diagnostic radiology. In 1975, he was appointed as the newly established chair of diagnostic radiology at the University of Manchester. "As well as publishing extensively, Ian had many interests including his work with curators at the Manchester Museum, where he pioneered CT techniques in Egyptology," Thomas wrote. Isherwood served as president of the Radiological Section of the U.K. Royal Society of Medicine, the British Society of Neuroradiologists, and the Manchester Medical Society, and he was a founder member and chairman of the Radiology History and Heritage Charitable Trust (now the British Society for the History of Radiology). He was dean of the newly formed European College of Radiological Education between 1992 and 1996. Isherwood received the BIR Barclay Prize in 1991 and the Gold Medal of the Royal College of Radiologists in 1995, and he was the Boris Rajewsky Medallist at ECR 1995. He was awarded the Commander of the Most Excellent Order of the British Empire (CBE) for services to radiology in 1996. The International Society of Radiology gave him the Béclère Medal in 1998, and he became an honorary member of the American College of Radiology in 1999. Isherwood's contribution to CT in the 1970s is generally viewed as his career high. One of his first examinations was of a deeply unconscious elderly woman with a head injury. The scan carried out immediately after admission revealed bilateral high-density hematomas with a central pineal gland. "Prior to CT it would have taken multiple burr holes to discover the extent of bleeding. As it was, the patient was taken straight to theater where the hematomas were evacuated and she made an excellent recovery," he wrote in 2007. "This single examination had a profound effect on neurosurgical colleagues and changed attitudes thereafter to the clinical management of head injuries. Indeed it was not long before any lack of CT facilities in the management of head injuries became a medicolegal issue. Demonstration of cystic and solid tumors together with differentiation of hemorrhage and infarct became routine." The control room at Manchester was small and dominated by the digital printer, Isherwood continued. "Results, in the early stages, necessitated evaluation of all the numerical data on the computer printout. The audible noise was deafening and frequently exceeded health and safety limits," he explained. "Digital to analog conversion resulted in a grayscale image on the television monitor which, after appropriate radiological interaction, was then captured using a Polaroid camera." The raw data were stored either on floppy disks or, later, magnetic tape. The Polaroid images on hard copy presented an initial problem of display at the daily meetings of the clinical and radiological teams concerned with clinical management, but it was eventually solved by means of a TV camera and a monitor. Initially, all images were viewed from above, with the right marker on the viewer's right, but this gave rise to real difficulties when body images came eventually to be viewed from below and the neck became "a no-man's land," Isherwood wrote. The fact that the grayscale image represented only the numerical data selected on interrogation by the radiologist was not always understood, but as CT requests increased, so pneumoencephalographic and angiographic requests fell. The departmental workload in terms of the inpatient-outpatient ratio rose in proportion to 2:1. Waiting times in Manchester increased to four months and then to six months. By 1974, staff carried out 1,653 scans, and by 1976 this figure rose to almost 3,000 at approximately 15 patients per day. Intravenous contrast -- 50 mL of Conray 420 -- which, of course, doubled the scan time -- had proved helpful in many pathological situations and was carried out in 60% to 70% of cases without complications. "News spread rapidly to both doctor and potential patient -- not always accurately," Isherwood added. "One request we had was addressed to the 'Cat Skinning Department' and even Snoopy explained that there might be more than one way to scan a cat! Requests for brain scans rained down, however, from all the clinical departments of the hospital." Importantly, CT permitted a separate assessment of trabecular and cortical bone in cross section -- seen to best advantage in a color display, according to Isherwood. He and his colleagues published an article entitled "Bone Mineral Estimation by Computer Assisted Transverse Axial Tomography" in the Lancet on 2 October 1976, and this was probably the first demonstration of the potential for direct trabecular bone measurement. 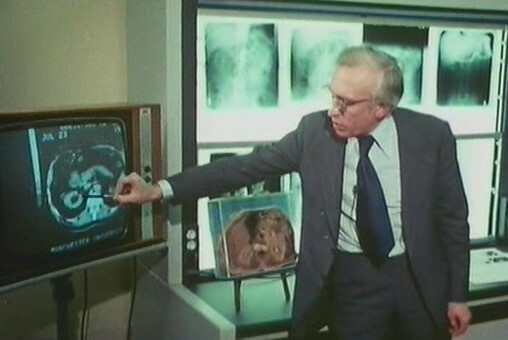 In 1975, the first international conference on CT was held in Bermuda, and Hounsfield announced a general-purpose scanner that did not require a water bath and enabled access to otherwise inaccessible parts of the body, providing enhanced diagnostic possibilities and also more effective application of treatment programs. "His announcement was greeted with a standing ovation and a queue of Americans waving checkbooks," Isherwood wrote. CT was made possible by computer speed and the microprocessor, he concluded. "It certainly had a profound effect on radiology, liberating with the first step the brain of both patient and doctor from the constraints of traditional imagery. It introduced the concepts of digital data acquisition, sophisticated interactive display systems, and powerful image processing to in vivo biological studies, at the same time providing a stimulus and scientific environment for other major developments to follow, including MRI," Isherwood noted. During their married life, Ian and Jean were inseparable, and Jean attended many conferences with Ian, Thomas noted. Jean predeceased Ian by only a few weeks. A funeral service for Isherwood will be held at St Mary's Church in Disley, near Manchester, at 1:30 p.m. on Friday, 21 September, followed by a funeral tea at 2:45 p.m. at the Ram's Head in Disley. Donations for Macmillan Cancer Support can be made via the Ian & Jean Isherwood JustGiving page.